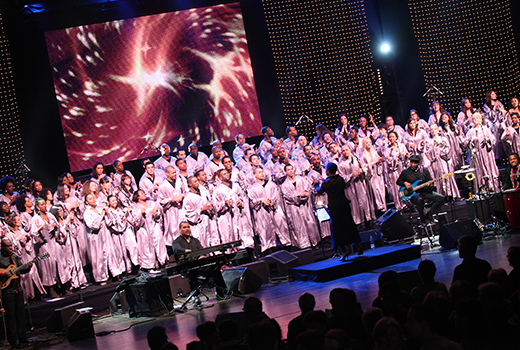 Amazingly successful , the 100 singers and musicians performing in “The 100 Voices of Gospel” show will go across France, Switzerland , Belgium, Germany, Italy and Spain in 2015, in a new series of monumental concerts with a brand new show! 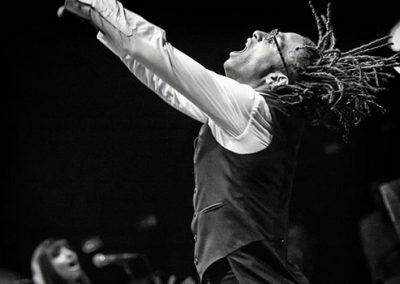 More than 200,000 albums sold, 5 performances in the Palais Omnisports Paris Bercy, 9 performances in the Palais des Sports, more than 350 tour dates , and over 1,000,000 fans, have made this show the biggest one of the Christian music industry. 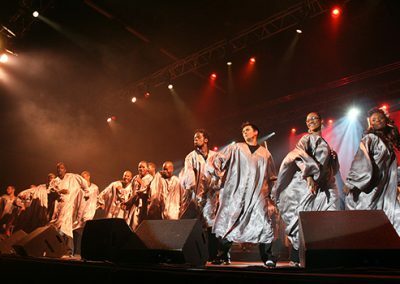 The Gospel music is an the encounter between the pain of the Black slaves and the joie de vivre of the Caribbean people. It’s becoming today a social phenomenon that touches everybody’s heart through the power of its message and the beauty of its repertoire. You should take a look at the joy and warmth transfiguring the singers on stage and then, you would understand! 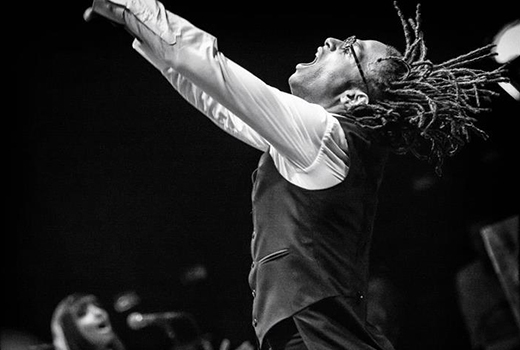 With some extremely talented singers and an overflowing energy, this amazing show has earned four GMA Dove Awards on Gospel Music in Los Angeles. The famous Choir Master from New York, Malik Young and the Artistic Director ( Jean- Baptiste Guyon assity John Carpenter ) joined the show. 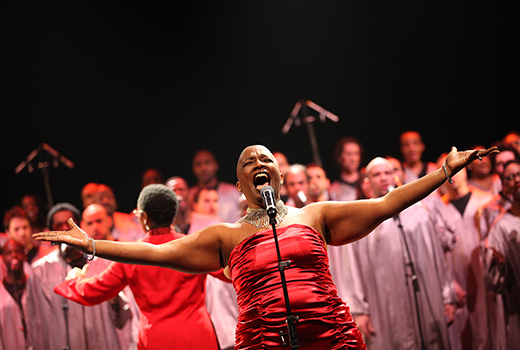 The artists of “The 100 Voices of Gospel” are among the best Gospel singers in the world. More than 1500 performers from all around the world have been auditioned for this show. 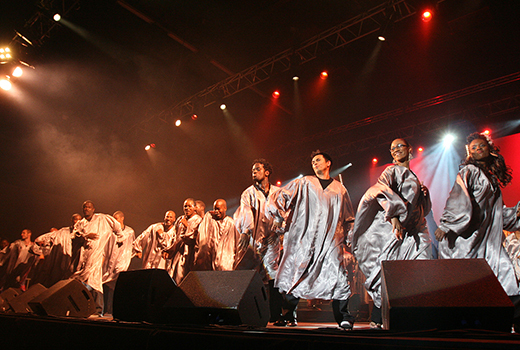 The selection process took several months and included auditions for vocal and dancing ability. The singers of “The 100 Voices of Gospel” come from 24 different countries and confessions, supervised by a complete American Art and Music team. Algeria , England, Argentina , Bali, Benin , Brazil, Chile , Bulgaria, Cameroon , Scotland, Spain , Congo, Guinea , Haiti , India, Italy, Jamaica , Laos, Madagascar , Morocco , Russia, Tunisia , USA, Switzerland as well as many people from Martinique , French Guiana, French Indies, Reunion Island. 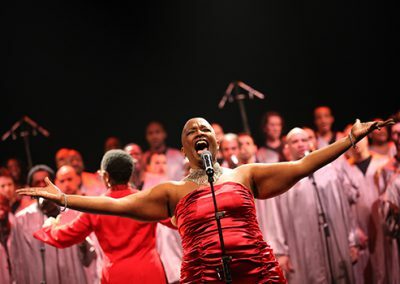 And many singers for Parisian musicals as The Lion King , Sister Act, Mamma Mia , The 10 Commandments… and many more.